There are many hotels near Port Canaveral from which to choose, if your family plans to cruise from the "Orlando" area (actual cruise port is about one hour east of Orlando). Without a doubt, cruising out of Port Canaveral to the Caribbean is highly popular among families from around the world. In fact, that is the main place to board a Disney Caribbean cruise. However, in addition to Disney Cruise Line, Carnival Cruise Lines, Norwegian Cruise Line and Royal Caribbean offer several cruise sailings from Port Canaveral to the Caribbean and the Bahamas. N.B. Click here for Bahamas Cruises from Orlando. In terms of hotels near Port Canaveral, you have two options from which to choose. 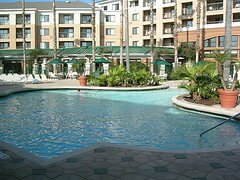 If your plans include visits to popular attractions in central Florida - Disney World, SeaWorld, The Holy Land, Universal Studios, etc, then you will want to choose hotels in the Orlando area. On the other hand, if you plan on visiting the John F. Kennedy Space Center, Cocoa Beach, etc., then you should choose hotels near Cocoa Beach. See Last minute Orlando values at Expedia.com! On this page I will recommend two hotels in the Orlando area and two near Cocoa Beach. I will also give you an opportunity to look at other hotels and see which online travel service has the best price for each property. HotelsCombined is a great hotel comparison service that allows you to do just that - compare prices! Address: 8113 Resort Village Drive, Orlando, Florida. Lake Buena Vista Resort gets a 4.4 out of 5 rating from those who have stayed there. That's impressive! Among its many features, this facility offers wireless Internet, a gymnasium, a jacuzzi and spa. Additionally, the hotel is ideally located in close proximity to top attractions in Orlando/Kissimmee: Disney World, SeaWorld and Universal Studios. Click here for more information on this hotel, see many more hotels and compare rates from competitors. Address: 8623 Vineland Avenue, Orlando, Florida. The Courtyard Hotel Marriott Village gets a whopping 4.5 out of 5 rating from past guests. The hotel is located only one mile from Downtown Disney and within easy reach of all the top Orlando/Kissimmee attractions. Among its many features, the Courtyard offers swimming pools, sun-decks, whirlpools, a fitness room and an arcade-game room. Click to find Orlando Hotels..
As noted above, I have listed only two of many hotels where your family may stay overnight before or after your inclusive Caribbean cruise from Port Canaveral. Whether you plan to visit a major Orlando attraction or just hang out Downtown Disney, you will enjoy relaxing before or after your inclusive Caribbean cruise. Address: 3655 N Atlantic Ave, Cocoa Beach, Florida. The Quality Suites offers some cool features such as Park and Cruise packages (you park for the duration of your cruise, plus get a free ride to the cruise terminal); and FREE continental breakfast. Additionally, the hotel is a short distance the John F. Kennedy Space Center and Patrick Air Force Base, among others. Your family will enjoy the Quality Suites' friendly staff and comfortable accommodations in addition to the fact that the hotel is a stone's throw from the famous Cocoa Beach. Address: 1550 North Atlantic Ave, Cocoa Beach, Florida. The Hilton Hotel Oceanfront Cocoa Beach actually sits on the beach. It is a great place to hang out before or after your family Caribbean cruise. 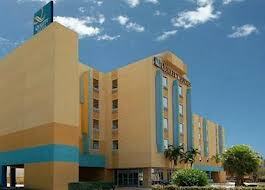 The hotel is a short distance from the Kennedy Space Center and the Port Canaveral Cruise Terminals. This Hilton Hotel is packaged as a resort-style destination and your family will enjoy the relaxing atmosphere plus have easy access to your desired attractions. Check out prior to 11:00 AM. 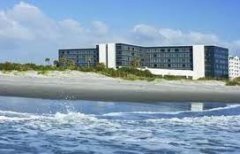 I have given you two of several hotels near Port Canaveral in the Cocoa Beach area to choose from. There are others. 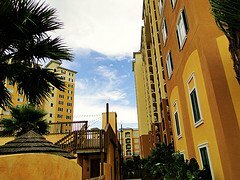 Use the Search Box below to find other hotels in Orlando or Cocoa Beach. Whether your family plans to stay at a hotel in the Orlando/Kissimmee area or near Cocoa Beach, you have two major airport choices. The quickest way to get to hotels near Port Canaveral in Orlando is to fly into the Orlando International Airport (MCO). The airport is about 30 minutes away from the Orlando/Kissimmee area and the major attractions listed above. Your family can choose to travel by taxi or shared-shuttle service to your hotel of choice. Mears Transportation is one well-established taxi and shuttle service that carries people from MCO to many points of interest in Orlando. You may visit Mears Transportation's webiste at: Mears Transportation, to obtain information on transfers to your hotel. The nearest airport to hotels near Port Canaveral in the Cocoa Beach area is the Melbourne International Airport (MLB), located 26 miles away. However, most people sailing out of Port Canaveral fly into Orlando International Airport (MCO) which is 42 miles away. For taxi or shuttle service, you may visit the airport's local transportation page. or All Around Taxi: 321-960-1944. There you have it. I hope that you have found this page helpful as you explore and compare hotels near Port Canaveral.